Piispala has altogether 11 kilometers of nature trails plus other trails for jogging. Snow shoes and Nordic-walking sticks are for rent. The closest place to swim is the beach few steps away from the Oinonen cottages. Sport Centre PiiSpa, just few hundred meters away, has a swimming hall, saunas, gym and bowling-alley. You can practice your forehand and backhand on the tennis courts that were completely refurbished in 2006. Piispala ski tracks do offer a long skiing-season due to use of snow cannons when necessary. The skiing-season starts usually in November. Part of the ski tracks are lighted, a stretch of 5 kilometers in all. Skis, ski-sticks, ski-shoes and anything else you may need for skiing, can all be rented from Piispala. Ice sports centre PiiSpa offers a place to practice all kinds of fun on ice. Skates can be rented. Football field with artificial turf is ideal for many kinds of games. Inside you can play volley ball, badminton, basketball and so forth. All equipment you need are rentable. Piispala has a climbing tower where to practice wall climbing and ice-climbing and also descend on a rope. 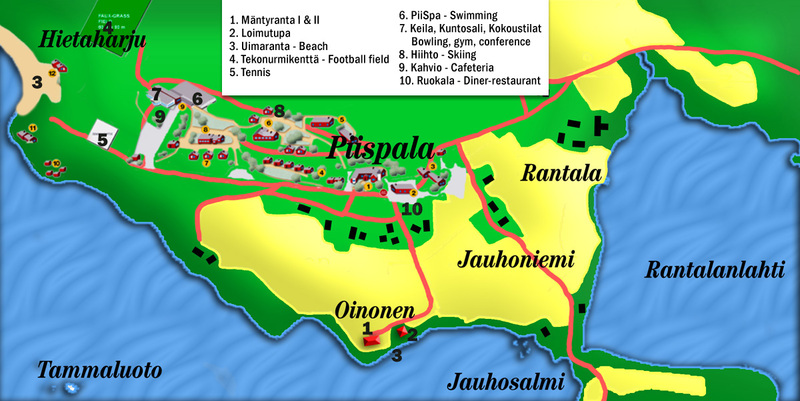 Piispala has a shooting range for airguns and archery. If speed is what you need, a rally center just a few kilometers away will come to help. You can do karting in there. A peculiar way to get a relief from stress is to do some berry picking in the Finnish pristine nature. Restaurant: Piispala buffet table serves you tasty dishes from morning till evening. Conference facilities: Piispala is a good spot for meetings. Many rooms of different size are provided with necessary AV-equipment. Many venues in Piispala offer plenty of customizability.